A family in Barcelona wanted a home with stunning views of the Mediterranean that was not only comfortable, but completely self-sufficient. 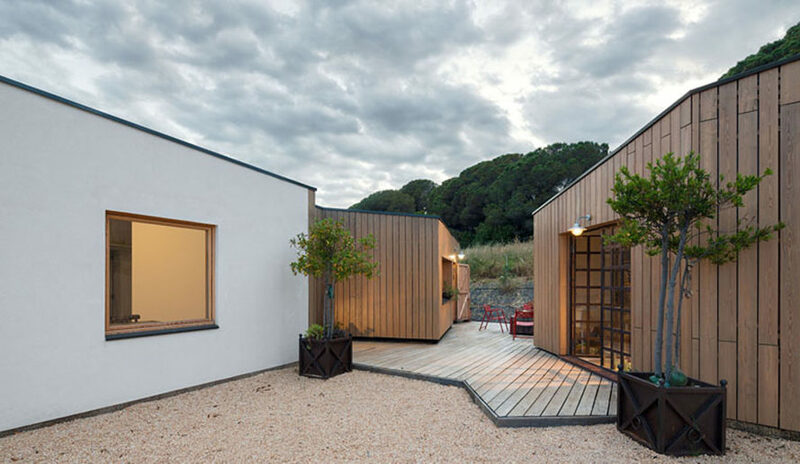 The resulting Zero Energy RM Passive House by Barcelona-based architecture studio Calderon Folch Sarsanedas is formed as a cluster of elegant pavilions connected by a central wooden terrace that reaches Passivhaus standards and consumes absolutely no energy. The house, located in Spain, functions as a single-family residence that provides privacy for each member of the household. The 198-square-meter (2,131-square-foot) house is located on a beautiful site overlooking the Mediterranean Sea. Its volume is broken up into several smaller volumes that share a 409-square-foot wooden terrace. The main challenge was to design a zero-energy building while providing a high degree of comfort. The RM House consumes extremely small amounts of energy which it produces from renewable energy sources. It complies with the rigorous Passivhaus standard and has a reduced environmental footprint thanks to efficient construction systems and materials. The 198-square-meter (2,131-square-foot) house is located on a beautiful site overlooking the Mediterranean Sea. Its volume is broken up into several smaller volumes that share a 409-square-foot wooden terrace. The main challenge was to design a zero-energy building while providing a high degree of comfort. The RM House consumes extremely small amounts of energy which it produces from renewable energy sources. It complies with the rigorous Passivhaus standard and has a reduced environmental footprint thanks to efficient construction systems and materials.